Last week, we reported that Disney was going to slow things down a bit on the Star Wars series, since Solo made it clear that audiences don’t necessarily need to see a new movie every single year, but that doesn’t mean anything’s going to change for Lucasfilm head—and mastermind of the modern Star Wars brand—Kathleen Kennedy. 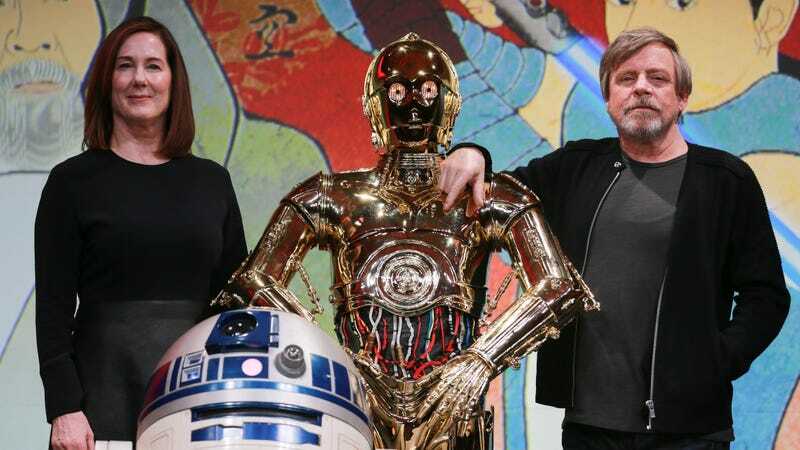 According to The Hollywood Reporter, Lucasfilm has renewed Kennedy’s contract for another three years, keeping her at the helm of the metaphorical starship through 2021. For those who don’t read the credits of the Star Wars movies and don’t realize just how important Kennedy is to the series, she’s the one in charge of making big decisions like, say, giving The Last Jedi director Rian Johnson his own spin-off trilogy despite the backlash from whiny babies, giving the Game Of Thrones guys their own movies, firing Colin Trevorrow from Episode IX, firing Phil Lord and Chris Miller from Solo, firing Josh Trank from whatever he was making, and re-hiring J.J. Abrams to direct Episode IX. Basically, everything you either like or don’t like about Star Wars these days is—at least one some level—because of Kathleen Kennedy, and she’s going to keep doing her thing for another few years.